Last Week's Tornado and Hail Add Up to $147 million in Estimated Insurance Damage—Making it Colorado's Most Costly Tornado and the 4th Most Expensive Insured Disaster. May 27, 2008 – This week residents in Windsor and surrounding communities are starting the process of repairing and rebuilding their homes, as they begin filing claims and meeting with insurance adjusters. Based on preliminary estimates the damage from the hail, wind and tornadoes are adding up to an estimated 20,000 claims and $147 million in insured damage to cars and homes from last Thursday's fierce storm. The estimated 8,000 property claims range from glass and roof damage to homes ripped from their foundations and completely destroyed from the force of the tornado. The estimated 12,000 auto claims range from everything to hail dents on cars to totaled vehicles. Homeowners insurance covers damage from tornadoes, wind and hail, while damage to vehicles is covered if you carry comprehensive insurance on your auto policy. $625 million insured hail damage: July 11, 1990. $276.7 million insured hail damage: June 13-14, 1984. $225 million insured hail damage: October 1, 1994. $147 million insured tornado and hail damage: May 22, 2008. $146.5 million insured hail damage: June 8-9, 2004. $128 million insured hail damage: August 11, 1997. $122 million in insured hail damage: May 22, 1996. $100 million in insured hail damage: May 30 – June 2, 1991. $93.3 million insured damage from heavy snow and ice: March 18-19, 2003. $87.8 million insured damage: October 16, 1998. When you are allowed back into your home contact your insurance company to set up a meeting with a claims adjuster. An adjuster will inspect the damage to your home and offer you a certain sum of money for repairs. The first check you get from your insurance company is often an advance against the total settlement amount. It is not the final payment. If you find other damage, you can “reopen” the claim and file for an additional amount. Most policies require claims to be filed within one year from the date of disaster. When both the structure of your home and personal belongings are damaged, you generally receive two separate checks from your insurance company, one for each category of damage. Hiring a reputable contractor to do repairs or construct a new home is critical. Word of mouth is still one of the best ways to choose a contractor. Also check with the area Home Builders Association, Better Business Bureau or Chamber of Commerce. Make certain they are licensed and have adequate insurance coverage. Don't become a victim of disaster fraud. After a natural disaster, professionals often go from door-to-door in damaged neighborhoods, offering clean up or repair services. Many of these business people are reputable. Others are not. Get more than one estimate. Don't be pushed into signing a contract right away. Get everything in writing. Cost, work to be done, materials, time schedule, guarantees, payment schedule and other expectations should be detailed. Demand references and check them out. Ask to see the salesperson's driver's license and write down the license number and license plate number. Ask for proof that the contractor is bonded, carries liability insurance, and covers his/her workers with workers compensation insurance. The contractor's business card should have a verifiable street address and office phone number. Never sign a contract with blanks; unacceptable terms can be added later. Never pay a contractor in full or sign a completion certificate until the work is finished. Request a lien waiver indicating the contractor has paid its subcontractors and suppliers. Insurance coverage may be rendered void if intentional misrepresentation by a policyholder is discovered. If you believe you have been approached by an unlicensed contractor or adjuster, or have been encouraged to fabricate an insurance claim, contact your insurance company or call the National Insurance Crime Bureau Hotline at 1-800-TEL-NICB (1-800-835-6422). The first step is to add up the cost of everything inside your home that has been damaged in the disaster. Now is the time to review your personal inventory, to help you remember the things you may have lost. 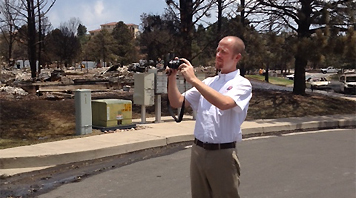 If you don't have an inventory, look for photographs or videotapes that picture the damaged areas. For expensive items, you may also contact your bank or credit card company for proof of purchase. When making your list, don't forget items that may be damaged in out of the way places such as the attic or tops of closets. Most companies provide coverage for 50% to 70% of the amount of insurance you have on the structure of your home. So if you have $100,000 worth of insurance on the structure of your home, you would have between $50,000 to $70,000 worth of coverage for your belongings. How Do I Get By While My Home is Repaired or Rebuilt? Standard homeowners insurance policies cover a certain amount of out-of-pocket expenses while you are forced to live elsewhere during rebuilding. Your check for additional living expenses should be made out to you and not your lender. This money has nothing to do with repairs to your home and you may have difficulty depositing or cashing the check if you can't get the mortgage lender's signature. This money is designed to cover your expenses for hotels, car rentals and other expenses you may incur while your home is being fixed.